I’m not quite sure what draws people more to Connan Mockasin, his infectious high-pitched dreamy vocals, or his innate ability to make being cooky, seem completely normal. His quirkiness continues to fuel my fascination with him and it only worsened in recent months when he dropped his debut album last month titled, Please Turn Me Into The Snat. 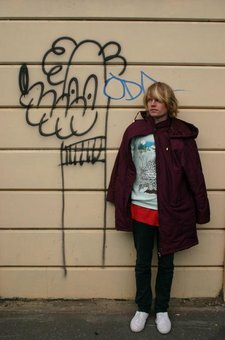 Hailing from Wellington, New Zealand, Connan (Connan Hosford) made a name for himself as the frontman for the band Connan and the Mockasins in 2006. After establishing a staunch indie following in England and playing CMJ in 2007, the band went their separate ways and he decided to branch out on his own. He recorded his debut solo record, Please Turn Me Into The Snat over 18 months between studios in London and New Zealand. I can’t find a way to describe this album any other way than brilliantly odd. But brilliant nevertheless. With the sudden surge in popularity of that “dream-pop” sound, Connan’s album is a refreshingly unique take on the sound and is well worth the listen.